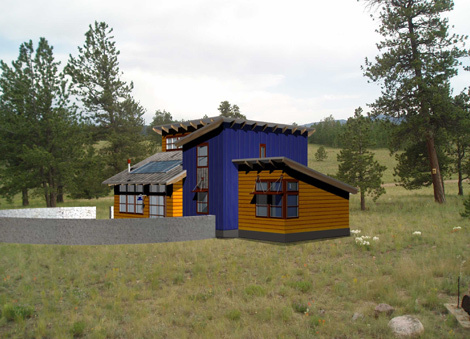 The clients had a piece of property in the Rocky Mountains at over 9000 foot elevation that is far from any utilities. They wanted a small home that would be totally self-sufficient, or off-the-grid, and that fits into the mountain environment. We took aesthetic inspiration from the area’s mining history with their shed roofs and modest materials. To make the house off-the-grid we designed a direct gain passive solar system with the optimum area of glass facing just east of south. For thermal mass we designed concrete floors and a masonry wall in the middle of the house that will be heated in the winter with clearstory windows. These clearstory windows will also provide beautiful, glare-free daylighting and convective cooling in the summer. With the lion’s share of energy addressed with passive solar design, we then added solar thermal panels for hot water and photovoltaic (PV) panels for all their electrical needs to create a zero-energy-home. 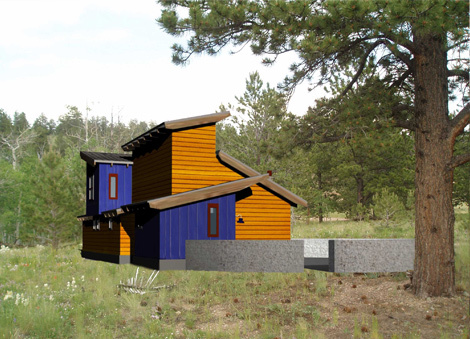 This house is an improved version of an earthship. 2008. 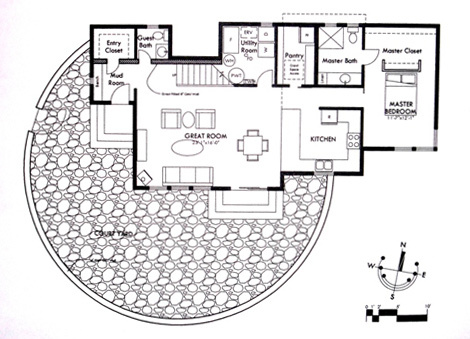 This house is featured in the video Passive Solar Simplified.